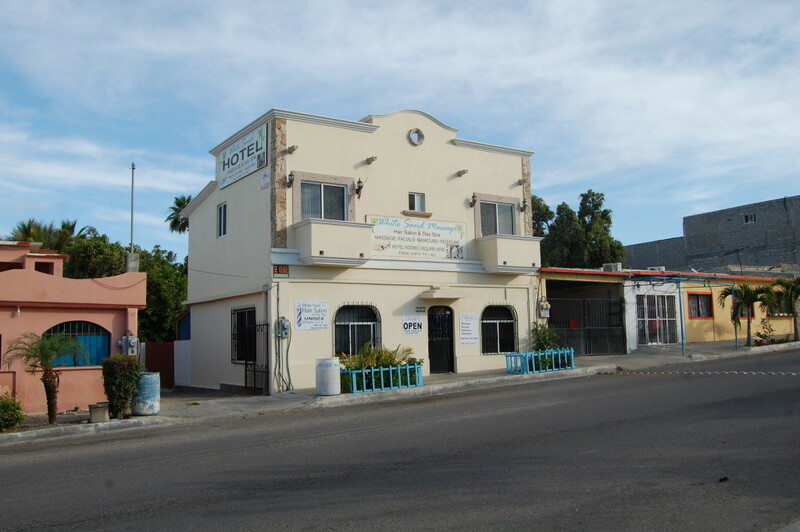 White Sand Hotel, Spa, and Hair Salon has an excellent location in downtown Todos Santos, on Calle H.C. Militar (the original stop light street) between Obregon and Hidalgo. It has approximately 2,000 sq. ft. under roof, including 5 bedrooms, 3 bathrooms, and a full kitchen. This building in versatile, and can easily be converted to fit your needs. It has been used in the past as residential, legal offices, spa and hair salon, and boutique hotel. The 1st floor has 2 bedrooms (offices, or massage rooms), a living room (or reception area), a half bathroom, and a full kitchen. The 2nd level has another 3 bedrooms and a full bathroom. The 3rd level has a lookout with a peak of the ocean view. There is also another outside full bathroom. Priced to sell at $325,000 with owner financing available!